Congratulations to Brenna Ganota who has been chosen as the client feature for May, 2016. 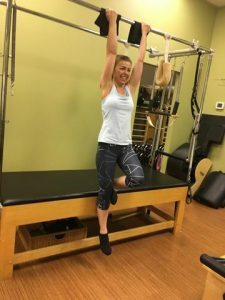 Hear what Brenna has to say about her experience at SMARTCore Method . . . I am so thankful for Kaylee Cahoon and her team at SMARTCore Fitness Method. I was led to pilates in the fall of 2011 after an intense personal season that severely imp acted my mind, body and spirit. Active all my life, suddenly basic fitness activities I had always done to de-stress and strengthen my body began to hurt me. Through prayer and research, I ended up at SMARTCore and began taking pilates mat classes with Jana three times a week. All I knew at the time was that something about the neuromuscular system and the interconnection of the mind and body was the direction I was supposed to head to heal. When I read Kaylee’s bio, I knew this was where I was supposed to go. Through the gentle, balanced and deliberate movements of pilates my body began to respond. I was amazed. When I first started with Jana, my hands were going numb and my neck was in pain. After the fluid movement of every mat class I would feel better – strengthened, restored, refreshed; after every boot camp I participated in (not at SmartCore!) the pain worsened. Something was right with pilates, something I needed. Each time Jana tweaked small changes in my form during mat class I would be shocked at the difference one inch to the right or left, or up or down would make. I began to have to connect my mind to my body in a new way, and to relearn what “exercise” really meant. Thus began my journey in reprogramming my body movement patterns and imbalances. 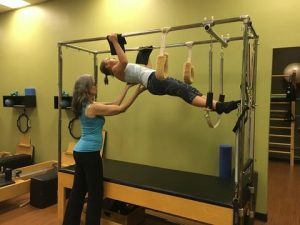 I was blessed to be one of Kaylee’s clients during her KMI training, and she began to integrate her KMI work within our pilates sessions, and further healing and reprogramming occurred. We discovered sources for my patterns as Kaylee’s intuitive body wisdom would guide our sessions. I slowly became stronger and grew more balanced. Through her KMI/Structural integration work she unlocked stuck places in my facsia tissue that were hindering me, which released my body to begin to heal and experience more freedom of movement. We dealt with root issues of pain, unlocking and unhooking sources of impingement rather than masking them with medications. It was amazing as sometimes the physical fascia releases would trigger emotional responses. I learned in new ways how our mind, body and spirit are interconnected. The new balance of unhindered fascia, strengthened muscles, and corrected movement patterns has been life-changing. When I w as strong enough, Kaylee encouraged me to start working with Maggie. Maggie has brought yet another level of intensity and revelation to my body movement and strength. She’s been able to push me in new ways that continue movement breakthroughs. I am learning to “find” places in my body that I didn’t know were lost (lol). Body movement and positioning are no longer subconscious to me. The searching for the mind-body connection of my hidden and lesser-used muscle groups has been fascinating, challenging, frustrating and empowering at each new “ah ha” moment when I finally “get” what Maggie is pushing me towards. I am stronger and I am being renewed. My awareness is different. My body is different. I am being strengthened and healed from the inside out. Health is a gift and healing is a process. Don’t give up if you are on your own journey! I am so grateful for the wonderful team at SMARTCore. You each have been a blessing in my life.